Nataliya Medyanyk of Brighton went airborne as she took a shot on goal during a beach handball game at Revere Beach last summer. 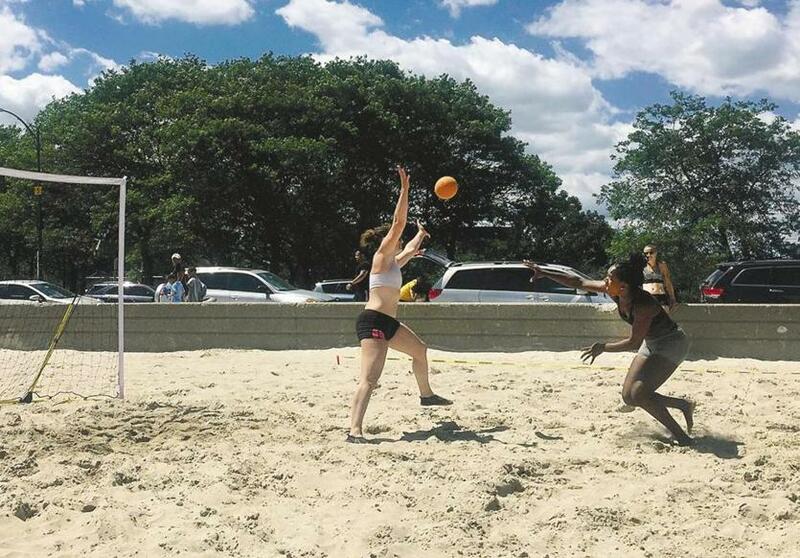 With the possible exception of the long-running Over the Hill Soccer League, there are few sporting activities that showcase our local diversity quite like beach handball. Held at Revere Beach most Sundays, weather permitting, throughout the summer, the games boast players born in the United States, France, Brazil, Cape Verde, Germany, Puerto Rico, and elsewhere participating in a sport that is far more popular, and better understood, abroad. The traditional indoor game is challenging, requiring agility and stamina. That also applies to the beach version. 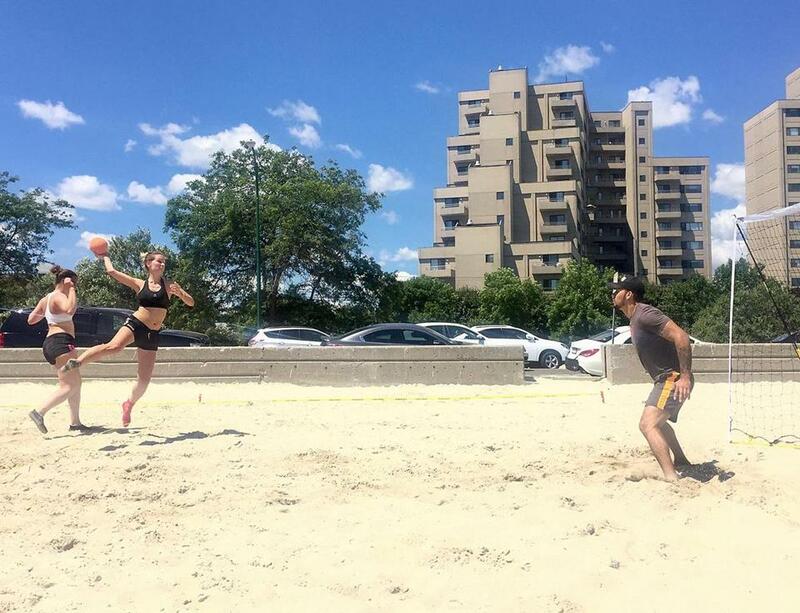 As Audrey Uffing of Boston looked on, Everett’s Jawad Bichri sought to make a pass while going on the attack in a beach handball game at Revere Beach last summer. Lucie Fraichard of Brighton took a shot on goal during a Revere Beach game last summer . . .
. . . and then Fraichard, left, tried to stop a shot taken by Binta Jau of Brockton. The Revere games are run by the Boston Team Handball Club, which has its roots in the global student body and staff at the Massachusetts Institute of Technology. During the indoor season, from September to May, the club has separate men’s and women’s teams that play at Melnea A. Cass Recreational Complex in Roxbury. After Memorial Day, the group heads to Revere Beach to hone their skills and keep fit. Team handball looks like a combination of several popular North American sports, including basketball, soccer, hockey, and volleyball. Several players refer to it as “water polo on land.” It features a ball, and the object of the game is to put that ball past a goalkeeper into a goal. Much like beach soccer or beach volleyball, beach handball looks similar to its more formal, more competitive indoor cousin, but also has distinct differences. Each team has four players instead of seven, and the games are played on a smaller “court.” The ball doesn’t bounce in the sand, so dribbling is nonexistent, putting a premium on player movement, crisp passing, and creative shot-making. Those trick shots — like shooting between your legs — are important, because goals scored with a higher degree of difficulty are weighted more favorably. Beach handball also has less contact between players, making it ideal for coed competition. And the atmosphere is more relaxed. 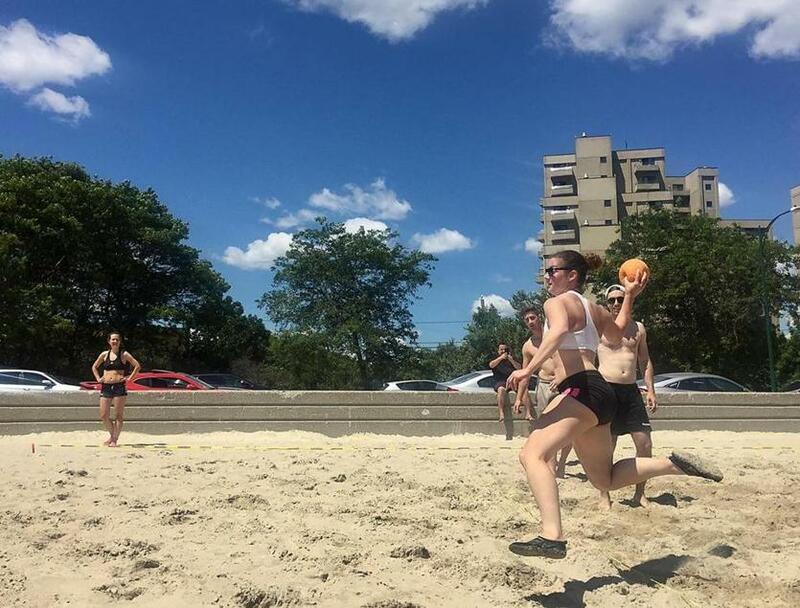 “It’s more fun to play coed during beach handball season because it’s a way for the two teams to hang out and get to know each other better,” said Quincy’s Robin Chan, 40. The USA Team Handball website calls beach handball the “new kid on the block.” The International Handball Federation officially recognized the game in 1994. The sport was featured in the 2013 World Games, and is being considered for the 2020 or 2024 Olympic Games. Allston’s Lucie Fraichard, who learned team handball growing up in Moirans-en-Montagne, France, said the beach version offers a nice introduction to the indoor game. “Beach handball is a great way to start playing handball if you’re a woman or a man,” said Fraichard, 31. “Without the contact, you can learn to pass, and have a better vision of the team strategy that leads to shooting and scoring. 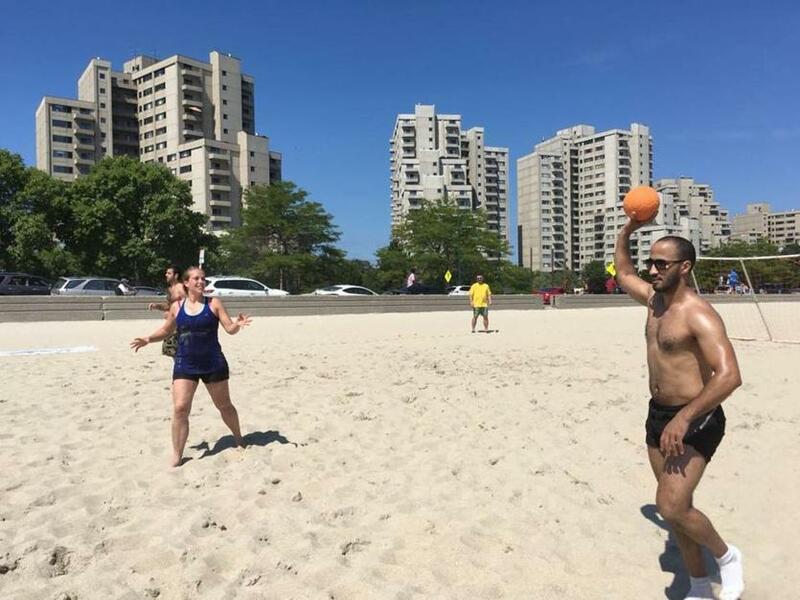 Beach handball at Revere Beach starts June 3. Prospective players can find game updates on the club’s Facebook page . The Revere games have featured players from their teens through their 50s, though the average age is mid- to late-20s. When they started up, said Jau, the group encountered considerable skepticism. If you have an idea for the Globe’s “On the Move” column, contact correspondent Brion O’Connor at brionoc@verizon.net. Allow at least a month’s advance notice.